Subject: PLEASE CONTACT THIS BANK FOR TRANSFER. here in Senegal as soon as you call, please ask him to pass the phone to Mrs Amanda Favour Smith. I WANT YOU TO CONTACT MY BANK WITH THIS EMAIL URGENTLY FOR COMMENCE OF THE TRANSFER PROCEDURE. The money is lodged in Bank Citibank of London because i lived there with my husband before we retired and went back to UK. Please my dear, i may not be strong enough to be writing to you every time but i am believing that you will not disappoint me or abandon this project no matter whether am still here or not. Do inform me once you have any communication with the bank as I have given full directives on what to do. Or you can even call him on that number because he may be busy to attend to you. I want you to cooperate with him by email i give to you so that the funds can be transferred smoothly. Do always remember me in your prayers. It shall be well with you and your family as you judiciously carry out this my last request. See attached the Deposit Certificate of the money for your perusal. God bless you and every member of your family as you carry out my last wish on earth, i have already informed the bank citi.bank.online@email.com about you, they will be waiting to hear from you, i want you to contact the bank with the above bank email addressso they will advice you the best way to transfer the money into your bank account, when you hear from the bank make sure you inform me and also follow their instruction so they will transfer the money into your bank account. I am going to be happy that my last wish is carried out. Hello Dear, how are you doing today ? I am very happy to read from you once again because of my health condition i can't reply you on time. The bank email addressciti.bank.online@email.com was wrong, please copy this email addressciti.bank.online1@accountant.com and contact them so that they will advice you on how they can transfer the money into your bank account, please do that now and update me. God bless you for everything you are doing to help me. Subject: Please contact the bank for transfer. Once again, thank you so much for your mail. I am so happy that at last my wishes will be carried out to the letter. I prayed to God before contacting you, that God should show me the right way and the right person and he did just that. I wish you can feel the joy and happiness in my soul right now. God's blessings will never depart from your house hold and he will direct your steps in all that you do. You will always be favored. I have received your details and I have forwarded it to my bank with a Letter of Introduction.I would like you to feel free to call me any time from the phoneof Dr. Mark Johnson Medical Group, that's taking care of me. .
in Senegal as soon as you call, please ask him to pass the phone to Mrs. Amanda Favour Smith.I WANT YOU TO CONTACT MY BANK WITH THESE EMAILS URGENTLY FOR COMMENCE OF THE TRANSFER PROCEDURE. . The money is lodged in Bank Citibank of London because i lived there with my husband before we retired and went back to UK. Please my dear, i may not be strong enough to be writing to you every time but i am believing that you will not disappoint me or abandon this project no matter whether am still here or not. Do inform me once you have any communication with the bank as I have given full directives on what to do. Or you can even call him on that number because he may be busy to attend to you. I want you to cooperate with him by email i give to you so that the funds can be transferred smoothly. Do always remember me in your prayers. It shall be well with you and your family as you judiciously carry out this my last request. 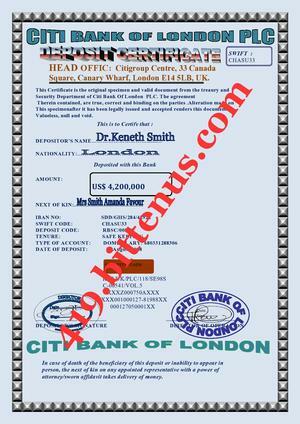 See attached the Deposit Certificate of the money for your perusal.